Delivered in 2016, The Adamo is a a mixed-used condo developed by Perseus Realty, LLC. Located in the Lanier Heights neighborhood right where Calvert Street Street intersects with Adams Mill Road and 18th Street, the 4-story condominium building offers 36 one and two bedroom condos. Residences at The Adamo features hardwood flooring, sliding glass doors, and beautiful quartz countertops. The Adamo’s location is to die for. The building is within walking distance of the Woodley Park-Zoo/Adams Morgan metro. 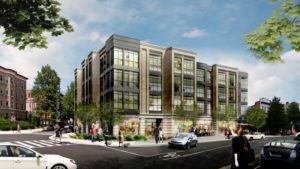 It is also within walking distance of all the stores and dining options that Adams Morgan has to offer.